Fried Zucchini Flowers remind me of Summers in Rome. The markets are full of them and they are a site to see when fully bloomed. The cheese oozes out with each bite. It has a delicious buttery flavor that goes so well with a glass of Sparkling Wine or Champagne. You really can’t go wrong here! 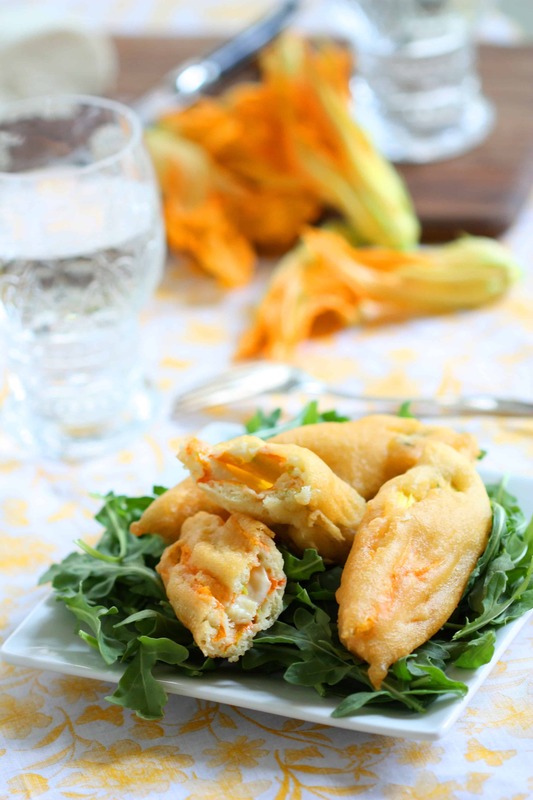 Fried Zucchini flowers are perfect for appetizers and look beautiful on a large tray. 1. In a bowl, stir the flour, salt, eggs, mineral water, 1 tablespoon vegetable oil. 2. Cut the mozzarella into sticks 1 inch long. 3. In a heavy frying pan at least 3 inches deep, pour in oil to a depth of 1 inch. Heat up until batter sizzles when dropped into the bowl. 4. While the oil is heating up, spread open the petals of each flower and carefully pinch out the filaments inside. Insert a piece of the cheese into each flower. Press the flowers closed. 5. One at a time, dip the flowers into the batter coating it completely. Lift the flower out of the batter and drain off the excess batter so there is a thinner layer of the batter covering the flower. 6. A few at at time gently slip the flowers into the oil and fry until golden brown on all sides. Using a slotted spoon transfer them to paper towels so they can drain. Continue this process until all of the flowers are done. Serve Immediately.